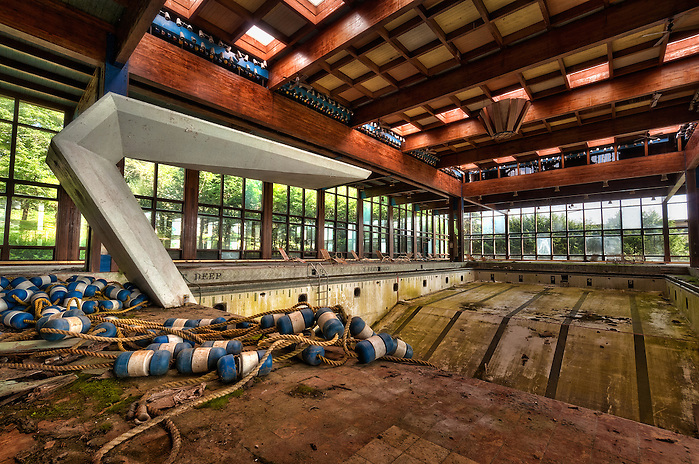 Day three of the 2010 Urban Exploration trip: Return to Grossinger’s Abandoned Resort in Liberty NY. In October of 2009 my fellow ArtByDecay.com photog Andy and I had visited the abandoned Grossinger’s Resort (you can read the original photo-blog here). The haunting beauty of a bygone age echoed from every crumbling room and we were dying to go back and revisit the location armed with flashlights and walkie talkies. This time around my brother Will and friend Dave joined us for the abandoned goodness. Last year the golf course was fairly desolate because of cold October temperatures, and sneaking in was not a problem. This time in July the golf course was in full swing (pun intended). We opted to simply park on the back road and enter from the side. Slipping in undetected always gets a sigh of relief. 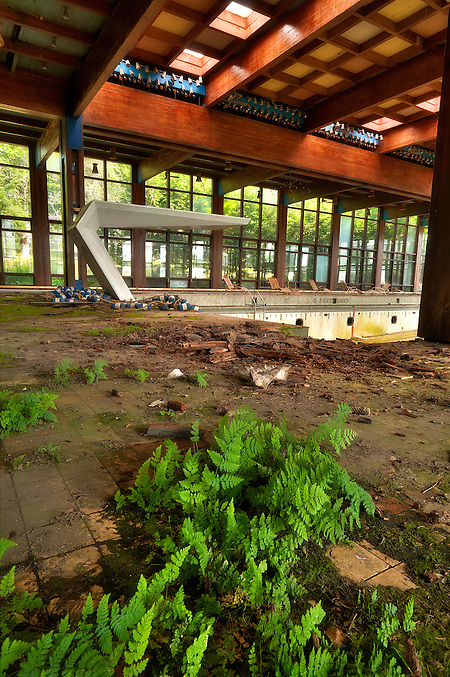 We headed for the outdoor pool first and presented to Will and Dave their first taste of the massive abandoned glory that Grossinger’s has to offer. It was a balmy 97 degrees and exhaustion from the previous two days of exploring was catching up with me so I didn’t take any serious pictures of the pool while we cooked under the summer sun. We walked around the complex then entered through a side entrance that we had not used last time. We found what might have been a large lobby at one point. The room now held only a scattering of random detritus. On the far side a grand staircase made its way up to a second floor balcony. We photographed this room and a few side rooms before continuing deeper into the building. Armed with a flashlight I felt braver than before and pushed further into the building in the direction of the indoor pool. I had only gone about 50 feet when my flashlight beam revealed a fog of humidity and particulates in the air. It was so dense that I was concerned about even removing my camera from the bag. Andy cautioned us to put our masks on as a precaution. As we walked around we realized we were actually below the massive indoor swimming pool. This area at one point was a spa. Directly below the deep end of the pool was a cracked and grimy glass window that looked into the swimming pool. In the adjacent rooms were a shower and changing area for the guests, and a locker room. The giant white shower curtains with the signature Grossinger’s “G” just begged to be taken for souvenirs, but our credo of leaving things untouched and unharmed resonated in my mind, and I opted for a silly portrait to remember instead! 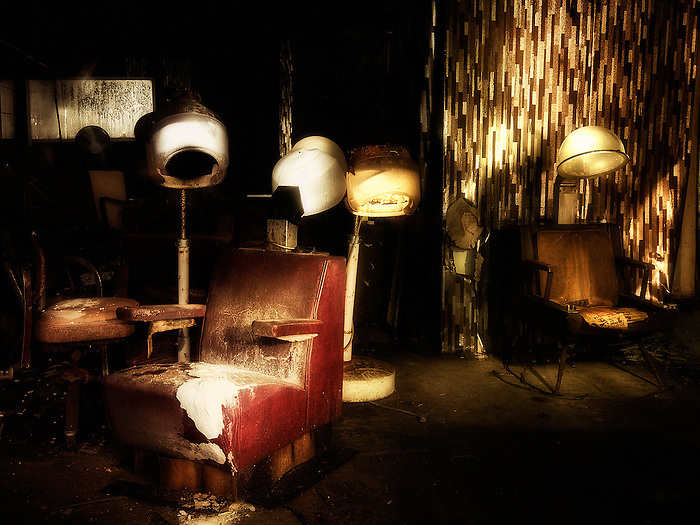 The remnants of a salon complete with vintage hair drying chairs stood haphazardly in a dark corner of the particulate clouded sub-level. This area was completely devoid of outside windows was almost pitch black. We set up and shot long exposures of 15+ seconds and ‘light painted’ the chairs with LED flashlights to get the desired effect. 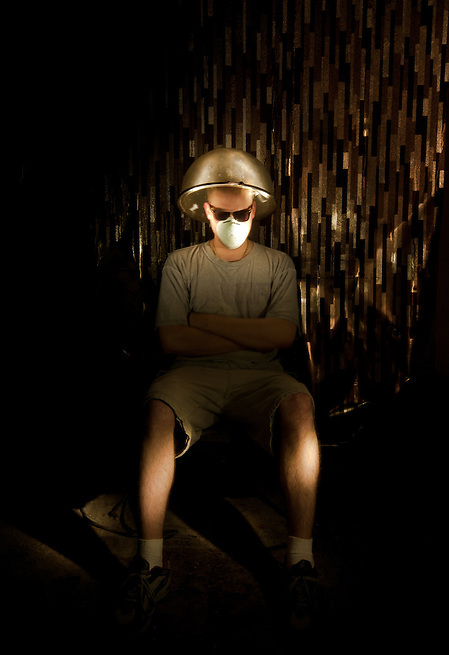 It was an interesting photographic experience shooting a subject that we could barely see, while wearing masks, in potentially hazardous environment. 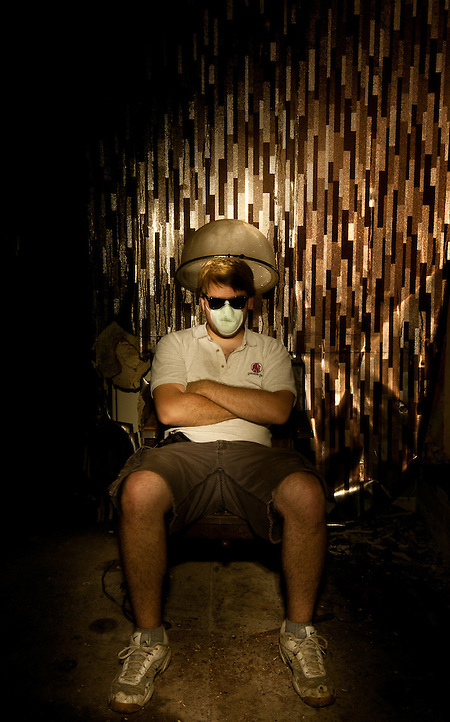 We shot for about 10 minutes until we got the right combination of shutter speed and light from the flashlights. Will and I took the opportunity to get some atypical portraits of ourselves sitting in the antique chairs. 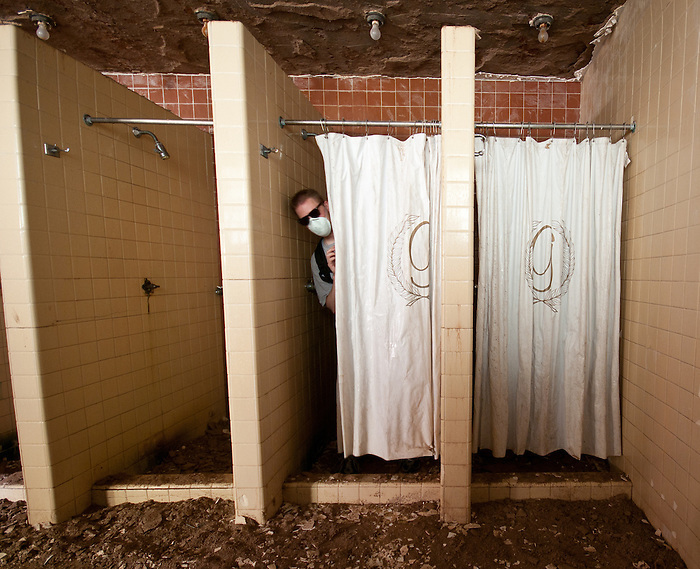 After 30 minutes in the Grossinger’s underground we headed up the stairs to the indoor pool. 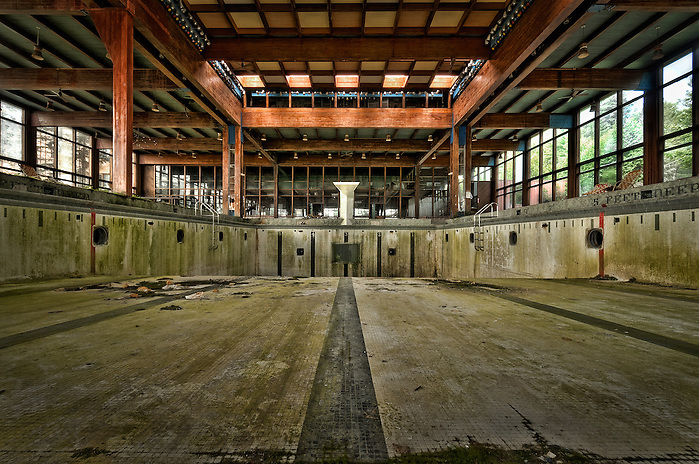 Grossinger’s pool is truly a sight to see. 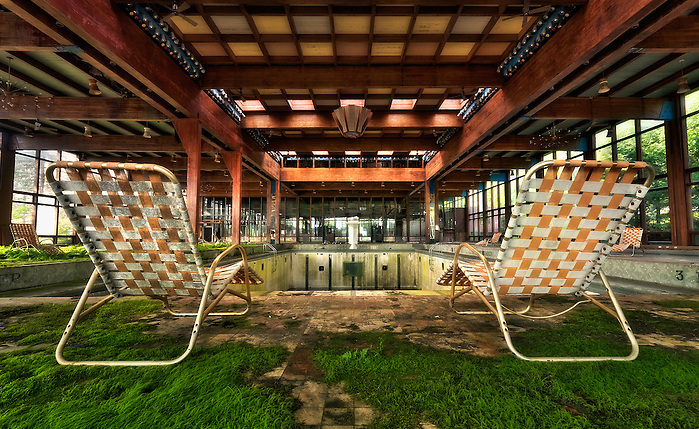 Even after our first visit, the indoor pool took our breath away. There is something about the massive space of the area that makes everything feel vast yet confined at the same time. 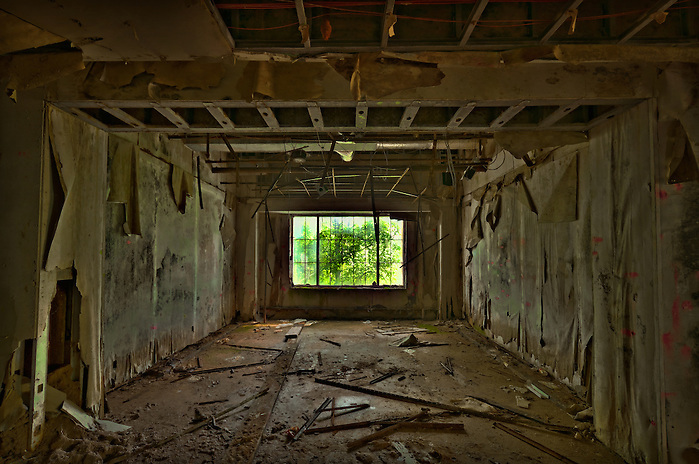 Strangely, I felt a sense of intimacy when in such a large enclosed and derelict space that is hard to describe. We spent a good 45 minutes shooting, composing, and yelling, asking if we were in each other’s frames as we shot. It was a feast of a scene and we devoured it! We headed back out and around the building the way we came in then continued around to the far side. We passed an entrance to a portion of the complex where I remembered a nasty prank that Andy had played on me during our last visit. Now that my younger brother was with us, I figured it would be a perfect time to play a mean ‘older brother’ prank on him! As we neared the entrance I stopped and acted excited saying “Oh! Will, you HAVE to step inside that entrance and look into the room to your left, you won’t believe what you see in there!” Given that it had been more than 10 years since I had played prank on him, he naively obliged and walked about 5 steps into the darkened entrance. As soon as he was fully inside the building, I picked up a medium sized rock, and hurled it through a broken window a few feet to his left! The rock nicked a shard of broken glass still hanging loosely in the window and made a beautifully loud and scary bang followed by the shattered glass clanking to the ground. Will bolted from the hotel, eyes wide and saying words that I can’t mention here! Dave, Andy, and I were cracking up and he soon realized that the joke was on him. I laughed even harder since Andy had done the exact same thing to me during our first visit! We left the dining room and walked up the steep embankment towards the old wooden building next to the ice rink. As we approached it, we could easily see just how bad of shape it was in. A back door hung from its hinges but we pushed our way through and into the building. The wooden floor boards had rotted away over the years. The floor was very soft and we stepped gingerly. At one point my foot actually broke through the floor. 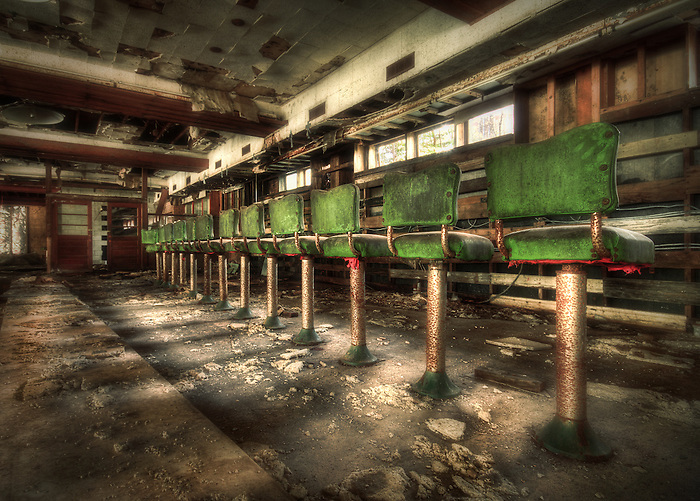 The room was lined with old benches that were shedding beautiful flaking paint in bright red and yellow colors. A large old sign read “North American Invitational Barrel Jumping”. Mosquitoes and high temperatures drove us back out into the hot summer air after 15 minutes. We left the ice rink and went back through the old dining room. As we reentered the dining room, we noticed a gap in the ceiling that permitted a very thin beam of late afternoon light to enter the darkened space. The beam shone brightly through the dust and debris hanging in the air and made for a beautiful shot. One of the members of our team (I will withhold names) happened to have a pack of cigarettes on them and we took advantage of the opportunity to make an interesting artistic shot with the wafts of smoke flowing through the light beam. We walked back to the car and bid a fond farewell to the “Titanic” of Urban Exploration. The return to Grossinger’s did not disappoint and we captured some new scenes as well as re-shot some of our favorites parts of the resort in a different season. Even in the killing heat of summer, Grossinger’s was alive in spirit. 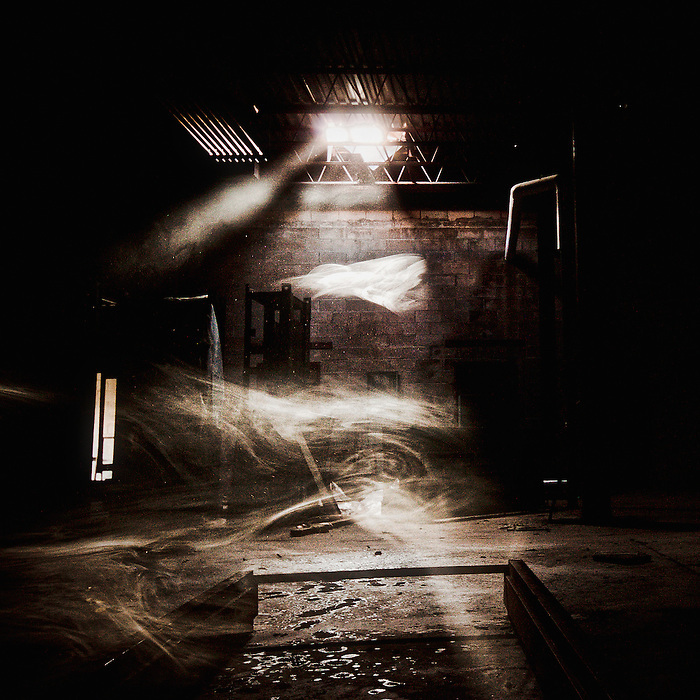 Countless ghosts, memories, and stories lurked around every decaying corner of the complex. Hopefully the images captured here will spark your own memories or conjure up stories even if you have never been to Grossinger’s. -Written by Walter Arnold Photography. Photos by Walter Arnold Photography unless otherwise noted. I recently saw Walter’s fantastic photography at a show near DC. I truly feel I found a treasure box when I saw his art! 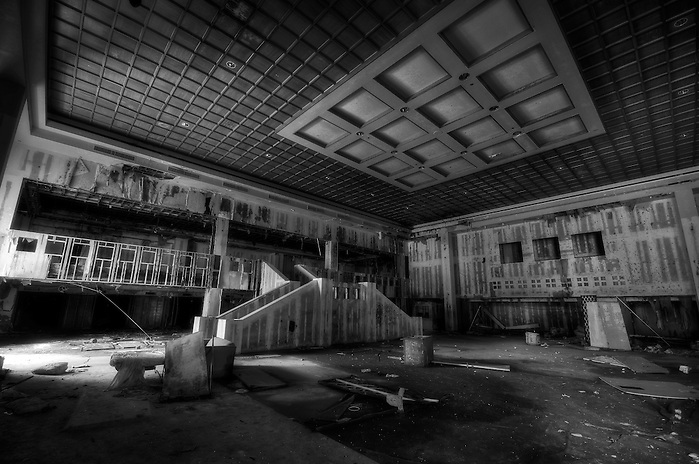 Haunting glimpses of what time has wrought…beauty in what is left behind. 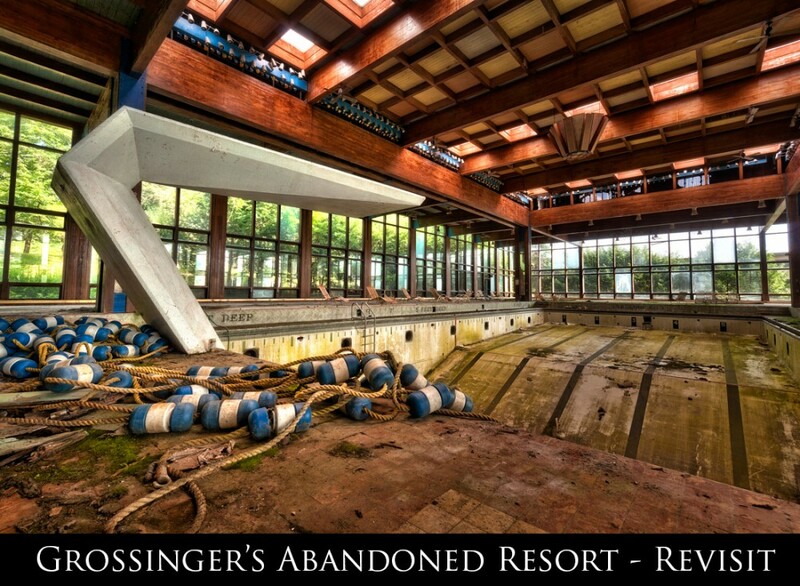 I chose Grossinger’s Abandoned Resort for many different reasons, the best – it spoke to me. Having just recently been on board to open a new luxury resort in the Fall of last year, I thank you Walter for reminding me to enjoy enjoy each day at work, make note of beauty in the woodwork, the lighting, the opulence – but most of all of the personalities and history of every guest that walks the halls and those that work there to “make the magic happen”. The rumors always pointed a finger at the gambling interests in Atlantic City who didn’t want competition from upstate New York. Supposedly, a lot of money changed hands to prevent gambling from ever happening up there! Do you have the backstory? 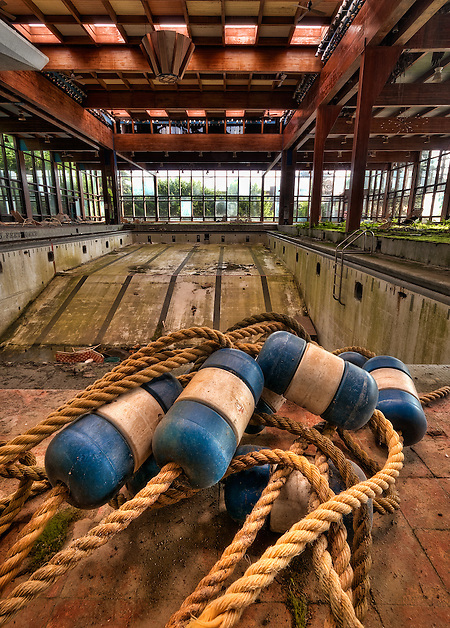 Do you know why these places were abandon? Grossinger’s closed in the mid 80’s due to the fact that NY state would not allow gambling. 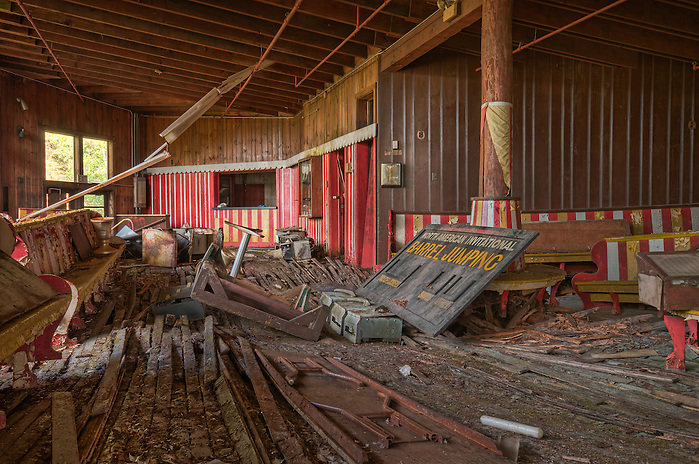 As a result, almost all of the Catskills resorts are now closed, torn down, and forgotten. My god! I wss talking tyo a frined of mine tonight a jew ish lady in Santa Barbara Ca. She was telling me to how to make a Baked apple in a micorwave for a snake. It reminded me of when i was verry youn bot in the main dinning room at The resort eating those ig baked apples. This is the first time i thought of the resort since i was a kid Im 47 now. It brings back amazing winter vacation memorries. s being explored. All though I know full well that there is nothing intentionally offensive about that eploration. It does have a different feeling about it for me having that connection. A feeling im sure ill be taking with me the next time I just can’t resist venturing into some abandoned farm house. I do very much respect your policy of not grave robbing. It was my father and grandfathers construction company “Maplewood stone Co.” Who either built or added on to those buildings and facilities that you where exploring. I spent a lot of time there in the late 60s-early 70s . My take on the whole Titanic concept is this…..This place is not about structures or artistic so called photo ops. Its about people and the characters and lives that where molded in this wonderful place. Unfortunately the whole Catskill region has succumbed to a cancerous outside element that has sent people elsewhere. Butch, thank you for your comment. I completely agree with you, what I and the photographers that I travel with strive to do is to help preserve the memory, spirit, and history of the location through our art. It goes beyond a photo op. We are looking to tell the story of these locations. I love to hear comments like yours as the help to express the real history and meaning that places like Grossinger’s still hold. Thank you for taking the time to share your story! This is great work. It’s also good to see that there are other urban explorers out there who don’t steal things. I would have also been tempted to take the shower curtain. I’ve came across many things that I would like to have taken, but I didn’t. Thank you for these incredible pics. Virtual journey complete. Must do a blog post on this asap. Loooooooove! So beautiful. Thanks so much for sharing!! These are amazing photos. Thanks fof sharing. Beautiful! I love your pictures! Awesome! Incredible shots and place to explore. It boggles my mind that such places are just left to ruin like that. I really really dig that diving platform!